Every entrepreneur and business owner works towards business growth – if they weren’t doing that their business would fall behind the competition and they would go broke. But sometimes, even if the small business has a great product, service, or customer base, the owner of said business may still find that it has stopped growing. There are a number of reasons why your management of the business may be the problem – here are five reasons your small business may have stopped growing and how to fix it. Most entrepreneurs who start a small business do so because they have big dreams and ambitions. They also have lots of enthusiasm and a belief that their business will grow from something they started in their garage in their spare time to something huge. But then after the company has started the daily grind distracts them from their initial ambitions of growing the business. They instead work simply to keep the business running, rather than to grow the business. Fixing this problem will take lots of energy on your part. Try to remember the growth plans you originally dreamed of, and now set new and bigger goals to work towards. One of the first pieces of advice most entrepreneurs receive when they want to start their own small business is to write a business plan – and that’s because a business plan is extremely useful. But there is one problem: what you write on paper is rarely the same as what actually happens in your day-to-day running of the business. You need to realise that business plans should be adapted to fit the current situation because what you originally planned may not always work later on as customer tastes change, new technology is developed, or the economy changes. 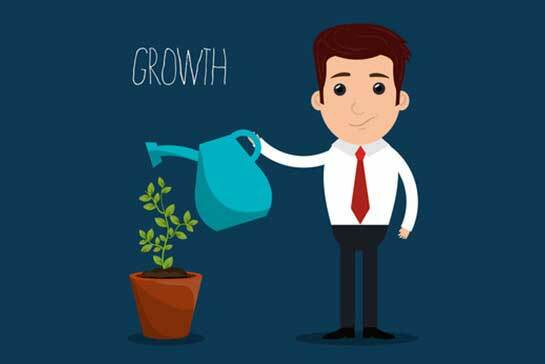 If you have been running your business for a while but you are still using your original plan, update it to reflect the current climate – this should set you on a path to a quicker business growth rate. When you first started your business, you had to do everything yourself because you didn’t have the money to hire anybody else. Now you probably still think you don’t have enough money. But if you want to see your small business grow into something bigger, you’ll have to take risks. Hiring a freelancer or consultant to do certain jobs might cost you in the short term, but it could lead to higher profits and a quicker rate of business growth in the long term. When attempting to grow a business, it’s often tempting to try the easy option of offering low prices in order to attract more customers. But the problem with this is it lowers your profit margins, and since people can use Google to compare prices in seconds, it’ll only work if you’re cheaper than all of your competitors, which is very unlikely to be the case. Instead of lowering your prices, look at ways you can add value to your product or service so you can justify higher prices. You’ll see higher profit margins, and a quicker rate of business growth. It’s well known that to be successful in business you need to stand out from the crowd, and show customers that you offer something different from your competitors. Still, it can be easy to get comfortable with how your business is operating and stop trying to differentiate yourself. The problem with this attitude is that your potential customers will have no reason to go to you over your competitors. The only way to fix this is to do things differently. It could be by offering a product or service not provided by your competitors, or offering the same services in a new, better way. Doing this will mean more customers, so a bigger profit margin, and bigger business growth.